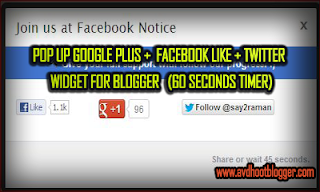 Beautiful 60 second timer Pop up box for Google plus, Twitter and Facebook like widget for blogger. A popup will remain for 6o seconds one of the best and top social media sharing widget for the blog. Social media sharing widget plays an important role in bringing traffic to your blog and also to increase Alexa rank and page rank of your blog. So we have designed such a widget which will make your blog more discoverable and searchable and it is pop up Google plus, Facebook like and Twitter widget for blogger and website. It will pop up every time when the visitor lands on your blog or website for 60 seconds so chances are higher to get more plus one and Facebook like for your blog and hence it is the best blogger widget to explore visibility of your blog. The importance of social media sharing widget. I will share how social media sharing widget for blogger helped one of the post to get on the first page of google. One of my post named as Google plus pop up box widget for blogger is in the first place in the Google search results with most widely used keywords like Google plus pop up box and the reason why it is on the first page of Google is a social media sharing widget for blogger. After writing this post I shared it on Google plus and all of my friends liked it and the results was this post many plus one and you what happened then Google rewarded me those plus one and the next day this post was on the first page of Google with top keywords. So it is a single proof how social media sharing widget can bring your post on Google search results without any backlinks. So you must specially focus on social media sharing tool if you want your post to appear in search engine results. And if you use these tools effectively and smartly you will get more Facebook likes and plus one of your posts. So add this Google plus, Facebook like and Twitter followers pop up box widget on your blogger blog and expand your blog visibility. Below I will tell you how to add this pop up Google plus, Twitter and Facebook like box widget to blogger blog. Replace Facebook username with your own Facebook like page of your blog or website. Use your own twitter username. Replace twitter username with your own twitter username. You have to replace Google plus +id with your Google +id. If you want to put a close button in the pop up box then replace then make it true which is the default. closeable: false. Description : Beautiful 60 second timer Pop up box for Google plus, Twitter and Facebook like widget for blogger. A popup will remain for 6o seconds one of the best and top social media sharing widget for the blog.